Ensembl 85 has been released! 19th July 2016 by Helen (Outreach)·Comments Off on Ensembl 85 has been released! Roadmap Epigenomics is producing epigenomic maps for stem cells and primary ex vivo tissues selected to represent the normal counterparts of tissues and organ systems frequently involved in human disease. In Ensembl 85, we have run our regulatory pipeline on Roadmap Epigenomics data for 30 cell/tissue types. Additionally, the peak calling component of the Ensembl Regulation Sequencing Analysis pipeline has been improved. All of the existing ENCODE and BLUEPRINT data in Ensembl’s Regulation database have been reprocessed. We now import symbol names from the Vertebrate Gene Nomenclature Committee (VGNC) for Chimpanzee. VGNC is an extension of HGNC for standardising naming across vertebrates lacking a nomenclature committee by transferring gene symbols from human to known orthologues. This replaces our own system for naming chimpanzee genes. This has improved our naming of chimpanzee genes as seen in POMGNT2, which was previously named GTDC2 in Ensembl 84. 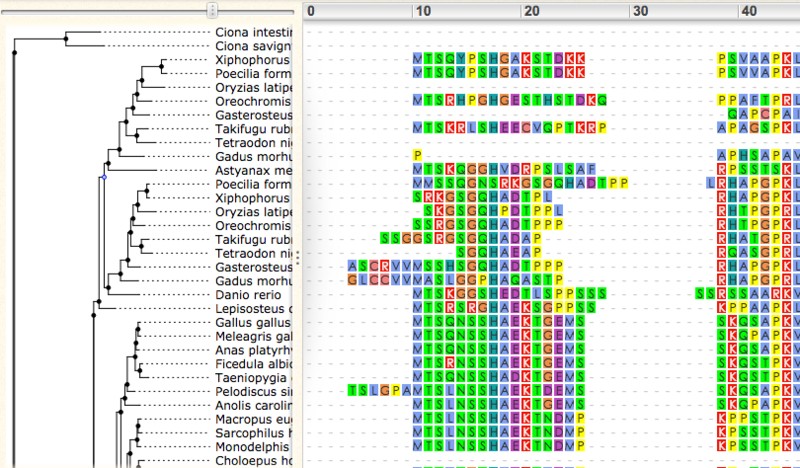 Wasabi has replaced Jalview as a way to view gene trees and multiple alignments. 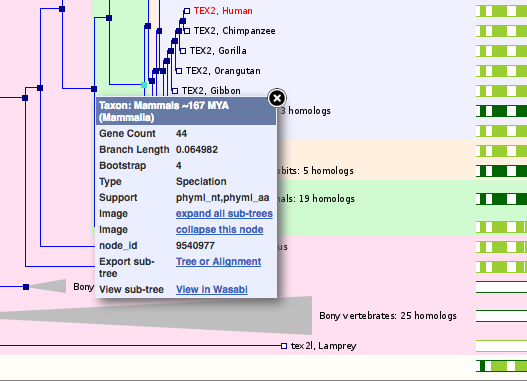 Clicking on any node within the gene tree will give you the option to ‘View in Wasabi’. A complete list of the changes can be found on the Ensembl website. Find out more about the new release and ask the team questions, in our free webinar: Wednesday 27th July, 4pm BST. Register here.